State and local governments across the country are loosening their spending belts as the economy continues to improve and officials appear less hesitant to make improvement in services. The change can be seen as communities bolster spending on elementary and secondary education programs after years of cutbacks and teacher layoffs. Spending on repairs and construction of roads and schools has also increased, as well as on health care for the poor. A recent report by the National Association of State Budget Officers shows “moderate growth and stability of state budgets in fiscal 2015,” with general fund spending and revenue projected to increase for the fifth consecutive year, based on the enacted budgets of the states. As state and local governments continue to benefit from the steady economic recovery, the new Republican Congress and President Obama must decide how much additional stimulus will be necessary to keep the economy on the right track. A decision to substantially beef up the federal highway construction program and funding for other infrastructure could make a big difference in job creation and investment in 2015. In sharp contrast to the period immediately following the Great Recession in late 2007 and early 2008, most states have enjoyed consistent year over year growth that has helped them steadily boost spending, reduce taxes and fees and close huge budget gaps in some cases. Nonetheless, spending growth is below average in fiscal 2015, as it has been throughout the economic recovery. “Overall, states are in a better position than they were a few years ago, but as the economy continues along a trajectory of slow growth, fiscal challenges are likely to persist from rising spending demands and lim­ited gains in revenue collections,” the report states. The New York Times reported on Thursday that state and local governments throughout the country are beginning to spend to address long-delayed priorities, including rehiring many of the teachers who were laid off in the depths of the recession and even a game warden to help distressed pelicans in Naples, Fla. Moreover, the combination of a declining federal deficit, historically low interest rates, surging federal and state tax revenues and steady improvement in economic growth is taking pressure off state and local officials to trim their budgets. Ron Haskins, a senior fellow at the Brookings Institution said on Friday that state and local governments are benefiting from Washington’s sudden loss of interest in addressing the projected long-term federal debt through spending cuts and entitlement reforms. Even with the Republicans taking control of both the House and Senate beginning next week, there appears to be support on both sides of the aisle for increased domestic spending, he said. Forty-three states adopted higher general fund spending lev­els in fiscal 2015 than they did in fiscal 2014. Aggregate spend­ing levels are also expected to rise in fiscal 2015, although by less than the historical average. General fund expen­ditures are projected to reach $751.6 billion in fiscal 2015, an increase of $22.7 billion or 3.1 percent over fiscal 2014. 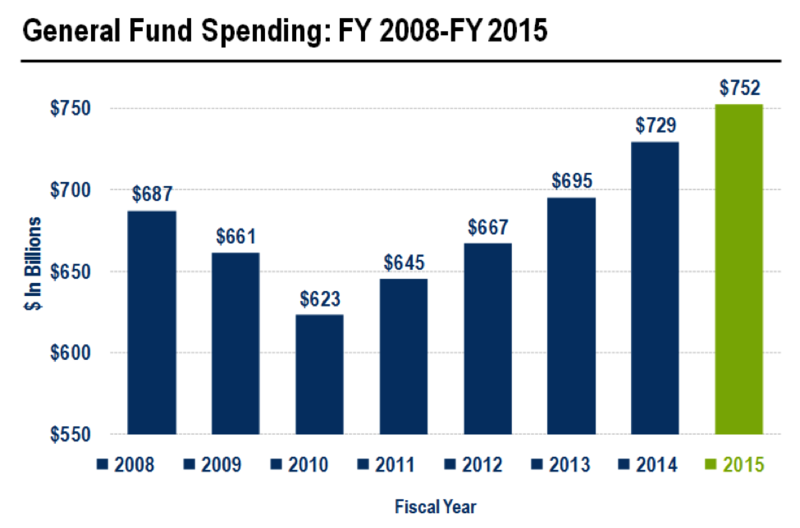 Spending increased by 4.9 percent in fiscal 2014 – which was the fastest rise in general fund expenditures since fiscal 2008. State revenue collections that year far exceeded projections and left many states with a year-end windfall that could be used for more spending. Spending increases in fiscal 2015 continued to be most heavily directed towards K-12 education and Medicaid, which received the majority of additional budget dollars. In all, 39 states approved general fund spending increases for K-12 education for a net increase of $11.1 billion. Thirty-six states increased spend­ing for Medicaid for a net increase of $8.5 billion. Forty states also increased spending for higher education for a net increase of $4.4 billion. Additionally, thirty-five states increased spend­ing for corrections, 12 states enacted increases for transporta­tion and 36 states increased spending for the all other category. Can States Justify Their Pricey Capitol Makeovers?